Navarre Chamber Members & Guests are invited to attend the Navarre area’s largest monthly networking event on Friday, March 29 at the Navarre Conference Center. Networking begins at 7 am, and the program will begin at 7:30 am. The Guest Speaker will be Santa Rosa County Sheriff Bob Johnson. The Chamber's Education Committee & Kool Breeze of Northwest Florida will be recognizing all the Santa Rosa County Teachers of the Year in the Navarre area. 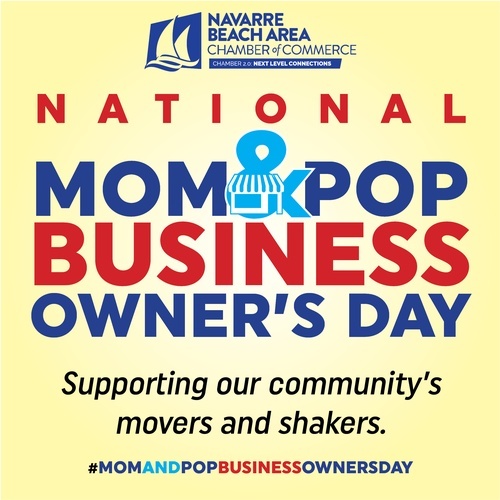 March 29 is #NationalMomAndPopBusinessOwnersDay - so we are inviting our small locally owned businesses to be part of the “March Member Showcase”. Showcase participants will receive complimentary space in the Showcase and meet more than 100 business owners & community leaders face to face.